Sony TVs are state of the art. With their fantastic picture quality and superior sound, they make a great addition to any home cinema system, living room or bedroom. Adding a Sony TV to your home will bring the family together as you watch your favourite films and programs. Catch up with your soap operas or sit back and enjoy a documentary, you’ll wonder how you ever managed without a Sony TV. 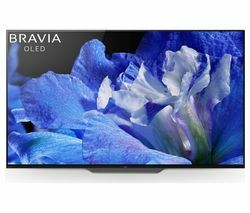 When you buy a Sony TV like the BRAVIA KD49X8309CBU Smart Ultra HD 4k 49" you get a TV with Ultra HD 4k that delivers up to four times the picture detail of Full HD TVs. The X-Reality PRO picture enhancement technology boosts content to give you incredible colour, clarity and definition, no matter what you’re watching. You also get Smart TV thanks to the addition of Android TV. So you can use your TV like a Smartphone or Android tablet and make use of entertainment apps such as Spotify and YouTube or keep up to date with your social media accounts. Whether you’re looking to upgrade your entertainment center or you fancy adding a TV to your bedroom, you’ll find a Sony TV that’s right for you.